Does Splintered Forest accept credit cards? Yes, we are able to accept all major credit and debit cards. How do I stay up-to-date on Splintered Forest happenings? Splintered Forest has numerous social media pages that are great resources for indiviudals looking to stay informed about fire mitigation, tree industry news and happenings at Splintered Forest. Like us on Facebook, follow us on Twitter or join our Google+ circle. You can also follow us on Instagram to get the #ViewFromThe SFCrew. Does Splintered Forest offer landscaping services? Splintered Forest does not currently offer landscaping services. Please give us a call for recommendations of companies that we currently work with. My estimate says broadcast chips, what does that mean? After the crew removes a tree or cuts off branches they will dispose of this material by chipping it. These chips can be disposed of by dumping them off at a trash facility, but this can be costly. The other option is to spray the chips back on to the property (broadcast). Is it safe to leave the woodchips on my property? Isn’t that a fire hazard? As long as the wood chips are not left in large piles (typically no more than four inches deep) they are not considered a fire hazard. How far should firewood be kept from my house or structure? Firewood should be stacked uphill from any structures and at least 30’ away (outside of Zone 1). Is Splintered Forest available for community presentations about fire mitigation? Yes, Splintered Forest is happy to attend your next meeting to give information about fire mitigation and explain the Colorado State Forest Service (CSFS) Guidelines more in-depth. We have given presentations at city hall meetings, home and garden shows, HOA meetings, club meetings, Realtor offices and insurance agencies. 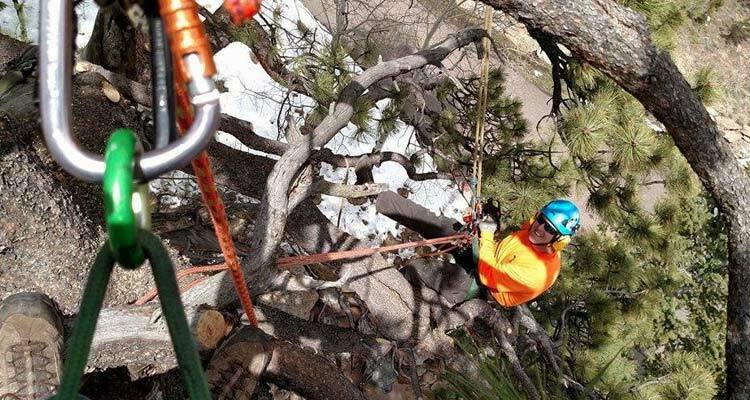 If you are interested in scheduling one of our ISA Certified Arborists for your next meet, please contact us at 303-819-9840. How much does it cost to remove a tree in my yard? There are a lot of factors that must be taken into account when determining the cost of tree removal such as height, diameter, health of the tree, proximity to the house or structure, hazards (i.e. power lines) and terrain. The Splintered Forest crew is happy to provide you with a free, written estimate for your next project.